Microsoft’s virtual desktops are one of the of the more unique features of Windows 10—a quick way to organize “screens” of apps that you can switch to back and forth. Rearranging them has always been a pain, but a new drag-and-drop feature, hopefully that problem will go away. Microsoft said it's expedited the ability to drag and drop windows between virtual desktops, eliminating the clunky keyboard shortcuts that Windows 10 currently forces one to use. Why this matters: Virtual desktops are handy tools for those with just a single monitor. If you have more than one monitor, you might have a chat app snapped alongside email and Twitter, while your main screen is devoted to a Web browser or presentation software. Moving from one monitor to the other is as easy as sliding your mouse. On a single monitor, a virtual desktop lets you quickly replace the chat/email/Twitter screen with the Web browser, without losing your place, by tapping WIN + CTRL + either the left or right arrow to shift between desktops. Once you have those virtual desktops set, adjusting them has been a royal pain—until now. To shift an app between desktops, you previously had to right-click it and manually select the virtual desktop—and if you had a bunch of them, you had to remember which one it was. Now, all you’ll need to do is open the “task view” button using WIN + TAB, then either drag and drop a window over the “New desktop” button to create a new desktop, or drag it onto an existing virtual desktop—exactly as you’d expect to. If those virtual desktop icons are just too small to see, you’ll be able to hover over them to get an expanded view. Microsoft also said it will let users decide one of the more divisive questions about virtual desktops: whether to see every app on a user’s system on the taskbar, or just the apps that reside in the virtual desktop that the user is currently viewing. If you get a notification asking you to weigh in, be sure you do. Your votes will help decide the default behavior, Microsoft said. 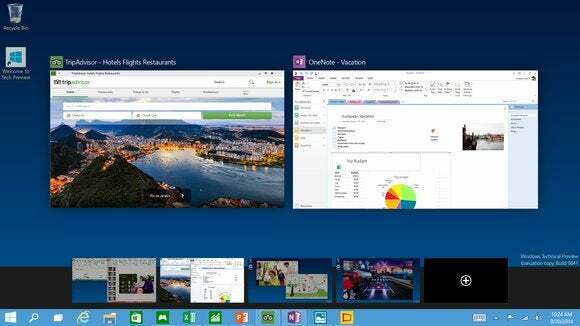 Are you someone that uses virtual desktops in Windows 10? Let us know in the comments.